Low-income families in Columbia are getting an opportunity to access affordable housing with the help of an NFL player. The Village at River’s Edge broke ground Wednesday, kicking off construction on a multifamily complex across from E.E. Taylor Elementary School off River Drive. “Affordable housing is not what we build, it’s what we finance,” said Reginald Barner, managing partner, with CHAMIRE Holdings LLC, an affordable housing development firm. Barner teamed up with business partner Charles Johnson, Carolina Panther’s captain and defensive end, to take on the project. 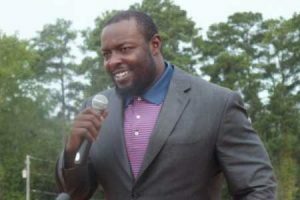 Johnson, a Georgia native, uses his own foundation to offer athletic, recreational and educational programs to underserved youth populations. Johnson said he plans to host some activities students at at the nearby elementary school. The Village at River’s Edge also received a $20 million investment. Barner said Bank of America providing construction financing, while other dollars came from a mix of bonds from America First Tax and federal HOME funds provided by the S.C. State Housing Finance and Development Authority. “What we’re going to create here is an environment that fosters growth for young people, to give them an address that they can be proud of, and that they don’t have to be ashamed of where they live,” Barner said. The housing development near the Broad River almost was lost to foreclosure as part of a lawsuit against former developer Jonathan Pinson, who was head of Village at River’s Edge LLC. NBSC bank foreclosed on the property and sued Pinson, who since has been sentenced to five years in prison for charges that include stealing money from development projects, according to court filings. Columbia Mayor Steve Benjamin was a partner in Village at River’s Edge LLC but sold his interest to Pinson in 2009 before before running for mayor. CHAMIRE Holdings bought the property in June 2013, which kept it from going to a foreclosure auction. Barner said he was asked by Columbia Housing Authority Executive Director Gil Walker to take over the housing development. CHAMIRE has no ties to the Pinson-led group. The new phase of Village at River’s Edge will feature 123 two-bedroom and three-bedroom townhouses. A community building will include an outdoor gazebo and children’s play area. The property currently houses 60 townhomes that were funded by the Columbia Housing Authority. Future plans include 26 townhouses and a 48-unit apartment building for elderly residents. The Columbia Housing Authority has about 7,000 families on its wait list who staff will review for eligibility. CHAMIRE Holdings has developed other properties including a new development in Concord, South Carolina. The firm also is branching into franchising after acquiring the Jan Pro cleaning system. Barner said a 15-month deadline has been set to complete the initial phase of the River’s Edge project. The first few homes are expected to be completed by February as construction continues into next year. Barner said he hopes financing will be complete for the next phase of the project by the end of the year so construction can begin at the beginning of January.